It was a balmy March afternoon in Reynolds County, Missouri; one of those days when a farmer keeps his eye on the sky because, well, you never know just what Mother Nature will throw at you. 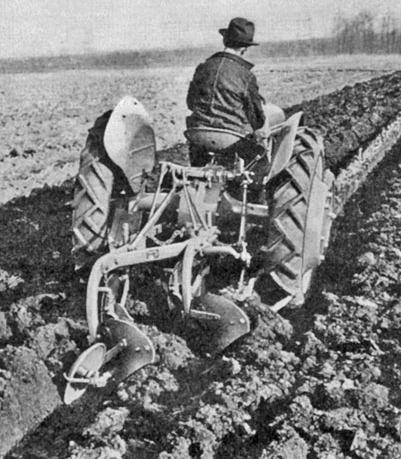 After a satisfying dinner of fried chicken - his favorite - the farmer walked back to the field considering just how long it would take to finish planting. As he surveyed the land, he had his back to the west so he never noticed the odd spectacle in the distance – a rolling cloud of what looked like fog coming right toward him. It passed in a matter of seconds, taking it with it countless seeds, the fresh turned soil … and the farmer’s life. 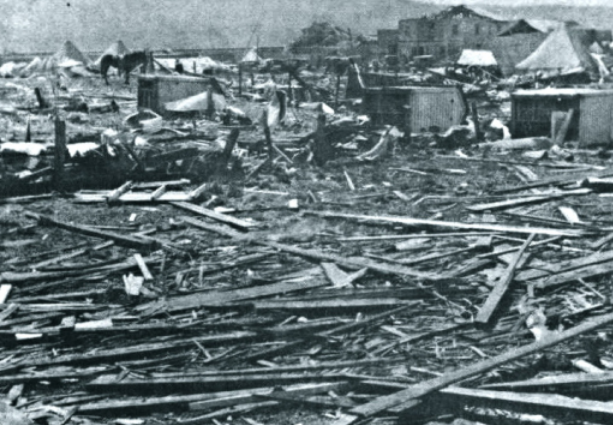 Thus was the beginning of the Tri-State Tornado – the deadliest tornado in American history – on March 18, 1925. No warnings had been issued, no sirens had been sounded, and not only because no one knew just how deadly this storm would become. The US Army Signal Corps was in charge of keeping track of the weather, which they did with reasonable accuracy for most situations, except tornadoes. 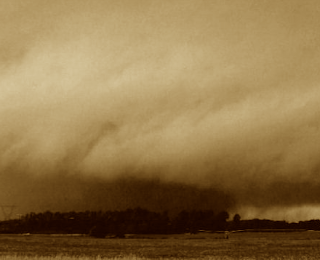 Back in 1887, the term “tornado” was banned from use in weather forecasting. Officials said that since tornadoes were so unpredictable, there was really no way to predict which way they’d go. They decided it best not to mention them at all that way the public wouldn’t become panicked when one was spotted. Radio was in its infancy, and television didn’t exist, so any attempt to warn people would have been left up to local churches and their tolling bells. But even that measure was not put into use. The tornado was building speed as it spun across southeastern Missouri that Wednesday afternoon. When it struck Annapolis in Bollinger County, it nearly leveled the town with two schools were heavily damaged. Eleven people were killed in Missouri. The deadly tornado crossed the Mississippi River into Illinois around 2:30pm gathering strength and sending out satellite tornadoes along the way. 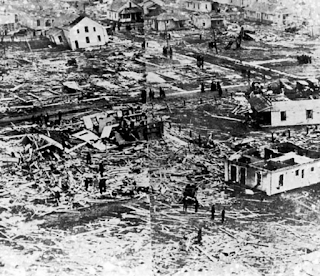 The town of Gorham was destroyed and 34 people were killed. 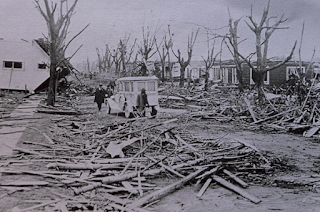 More than 100 square blocks in Murphysboro Illinois were flattened, and another 70 blocks were destroyed by fire after the tornado passed. The death toll hit 234 people including 26 children who were still in school when the building was demolished around them. 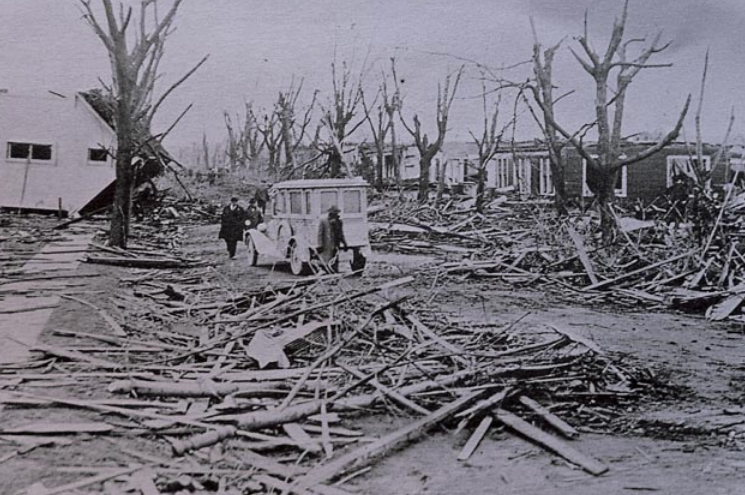 Murphysboro still has the highest single city death toll, due to a tornado, in US history. Near the town of Desoto, 69 people died; 33 were students at a school. The town was so grief-stricken, all were buried in one mass grave. The town of West Frankfort was known for mining and at that time of day, most of the men were working underground. No one knew anything had happened 500 feet above ground until the electricity went out. When the miners surfaced, they discovered 148 dead, mostly women and children; another 400 sustained injuries. 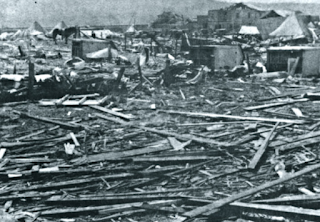 The tornado then ripped through the town of Parrish taking 22 lives. Illinois was the state hardest hit with a death toll of 619 residents. 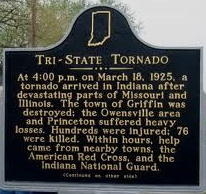 The twister crossed the Wabash River into southern Indiana where the town of Griffin was demolished. Twenty-six were killed in the tiny burg. The tornado then curved a bit to the north and headed toward Princeton, destroying 85% of the farms along the way. The southern end of Princeton was destroyed while the northern side was untouched. Forty-five people were killed in minutes. The tornado finally began loosing strength and dissipated around 4:30pm about 2 ½ miles south of Petersburg in Pike County. The tornado had taken 76 Hoosier lives. 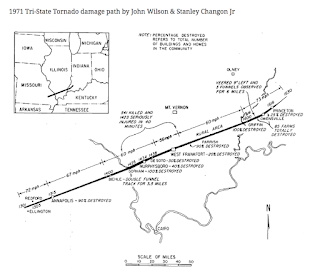 When the dust had settled on that day, the twister had killed 695 people; 613 in Illinois. More than 2,000 sustained injuries, again the majority in southern Illinois. 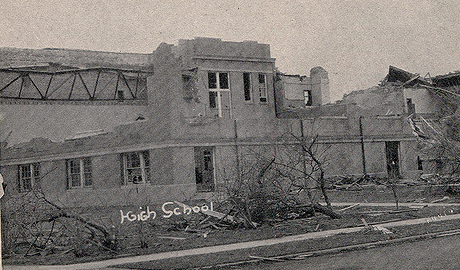 The tornado was on the ground for 3 ½ hours and destroyed more than 15,000 homes and nine schools – taking the lives of 72 students. 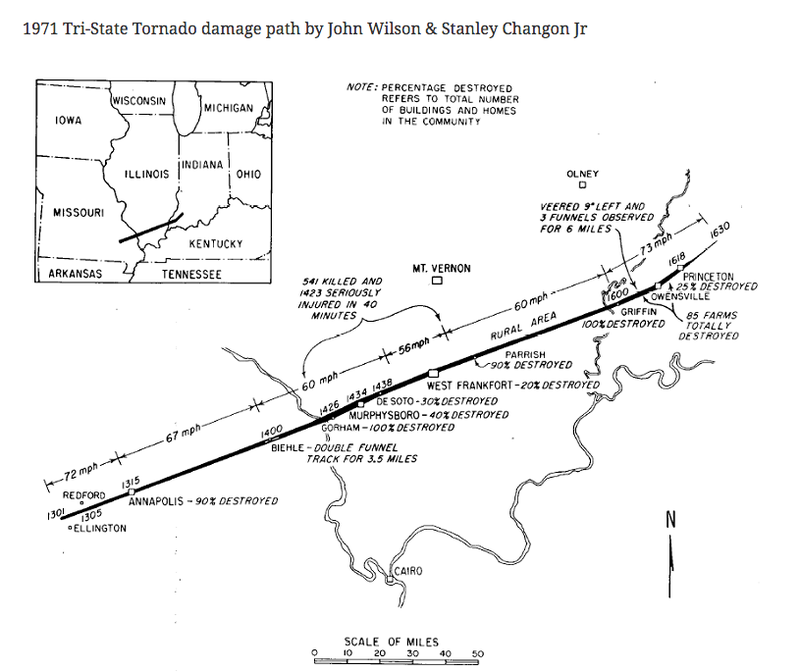 The Tri-State Tornado was part of a large tornado outbreak that day that also included the states of Kentucky, Tennessee, Alabama and Kansas. 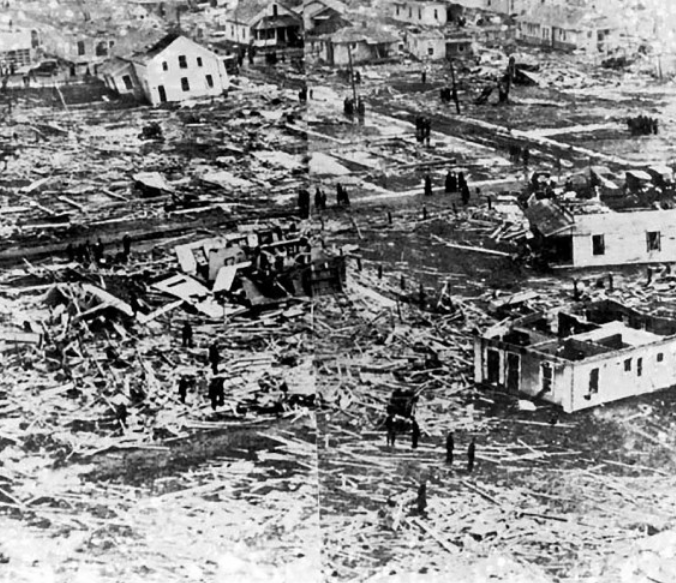 Another 747 people were killed in those storms, making March 18 the deadliest day in tornado history, and 1925 the deadliest year for tornadoes in the US. Stroll through some of the local cemeteries in these hard-hit towns and you will find lasting tributes and reminders of a March tornado that changed the residents lives forever.